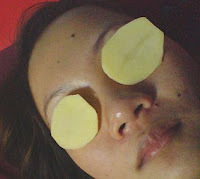 i know i look ridiculous but what the heck...i've been reading a lot of articles that instead of cucumbers, potatoes are a better bet if you need a quick fix for puffiness and dark undereye circles. after getting a few slices, i put them inside the freezer for 5mins and put them on. I immediately felt refreshed and there was a cooling effect. i took it off after 15 minutes and i dunno if it was just my imagination or the potatoes' promise are true but i can swear it lessened the puffiness and dark circles. the skin under my eyes also looked firm...whoa! basta, my undereyes looked way better after putting those potatoes.